Our 2nd ever R.D. 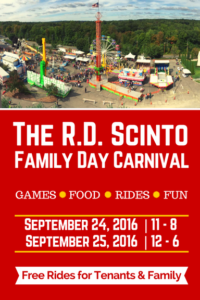 Scinto Family Day Carnival will take place at the end of September. To register for the R.D. 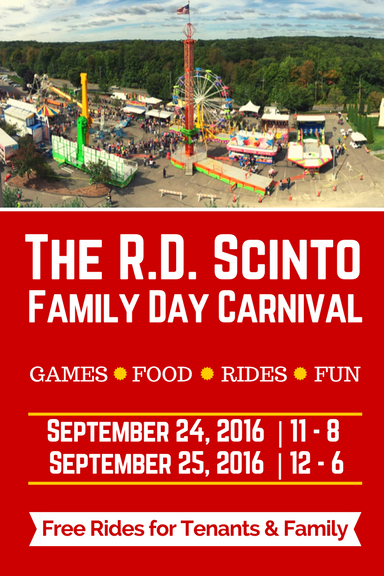 Scinto Family Day Carnival, please speak to your company representative. We are going to get a count for this just like we did for the Picnic. Please have one person from your company contact us with a grand total of adults and children (one total count) and we will mail the wristbands for this just like we did for the Picnic. Tenants and their guests must preregister and receive wristbands in order to ride for free. Food and concessions will be available for purchase. 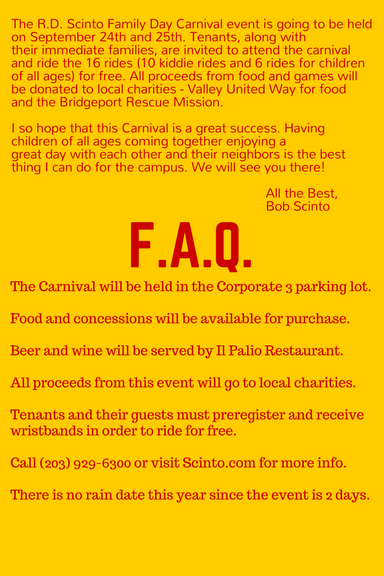 Beer and wine will be served by Il Palio Restaurant to attendees 21 or older. All proceeds from this event, plus 10% of profits from the vendors will go to local charities. Call (203) 929-6300 for more info. There is no rain date this year since the event is 2 days. 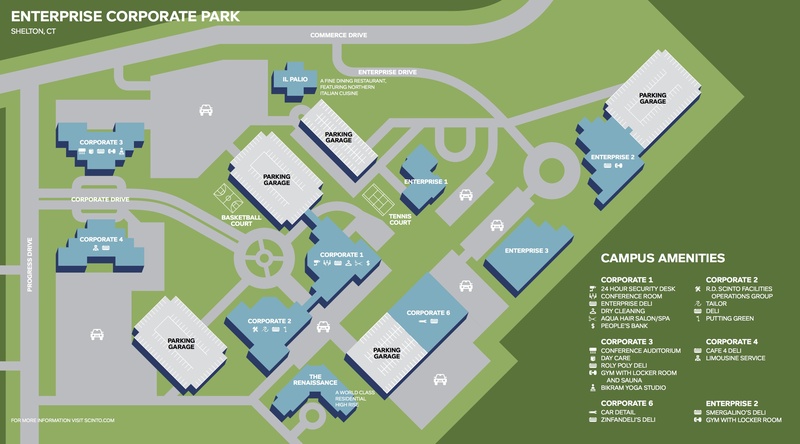 The Carnival will be held in the Corporate 3 parking lot. 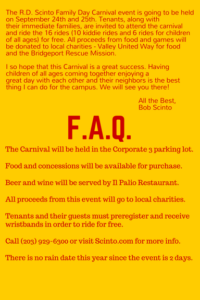 It will have an Italian theme and 16 carnival rides – 10 “kiddie” rides and 6 rides for kids of all ages. Please use your best judgement when determining who to include as “immediate family”. While we do not want to exclude anyone, this event is intended for our tenants, their employees, and their closest family members, including children and grandchildren. Any guest not of relation will have the option to purchase a wristband upon arrival to the event at the price of $20 per wristband. Each person will receive one wristband, which will get them into the event and on the rides for free. If you wish to attend both days, keep the wristband on overnight.